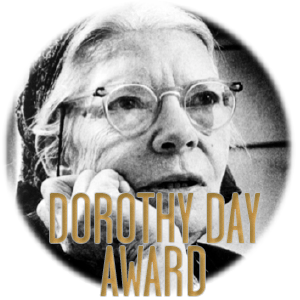 The Dorothy Day Award recognises young people engaged with those around them, making their community a better place for all. Human beings exist in relation to one another. We’re called to live with others, be aware of others, communicating, sharing, enjoying moments of joy and being there together in times of sadness. All of us are called to participate, to join in, to work alongside others for the common good of all. Do you know a young person who’s led an SVP group to spend time with the elderly outside of school hours or worked with the local community to combat gang related violence? Has someone shown true leadership and led a group of their peers to participate in social action in the community? Perhaps they have a passion for reading and spearheaded a campaign against the local library closure? Maybe there is a student who is exceptionally involved in the chaplaincy and is always there to support other students? One of the 2016 award recipients was Flavia, a Sixth Form student from London, with a passion for social justice. Flavia was nominated by her chaplain who said: “I would like to nominate Flavia due to the contributions she has made to her community over the last year..." See more below. Nominations are now open.